For many people and for many reasons: unions matter! 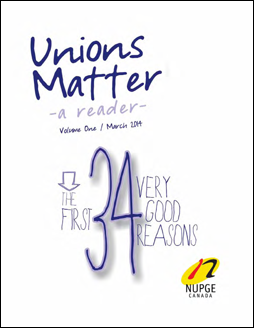 Volume One of Unions Matter: A reader contains a collection of work from a variety of sources telling the story of the power of unions and their members. The writings come from authors, poets, activists and singer-songwriters sharing why unions matter to them. The reader also contains some of the work from the Why Unions Matter contest winners.